We docked within walking distance of the capital, Ajaccio, the birthplace of Napoleon. With plenty of statues and street names like Bonaparte Street, Ajaccio also has a museum in the house where he was born. We had decided our visit to this island would not be history but, instead, scenery. So we booked a ship excursion to Calanches, in French Les calanches de Piana, found within the Regional Natural Park of the island. Also called calanques, the rock formations are found throughout the Mediterranean and are narrow, steep-walled inlets of limestone, dolomite or other carbonate strata. We headed north, over mountain passes, on switchback roads, overlooking beautiful mountain scenery. The ride out there was an experience in itself, with roads barely wide enough for a full sized bus and an automobile going in the opposite direction to pass each other. But it wasn't until we actually got to the park that we found what all the excitement is about. The formations were fantastic. Everywhere you looked was an eyeful. Our visit to Corsica was only a couple of hours and way too soon we had to leave the park. We made a quick stop in Porto, a beautiful old town, and then back on the bus to the ship. Rain! Not what we were suppose to have this time of year. But it wasn't going to stop us. Another item long on my bucket list has been driving along the Amalfi Coast and that is what we were going to do today. We soon joined up with Stacie and Karen, two ladies I met through the Cruise Critic forum, who expressed an interest in joining our Amalfi Coast tour. We left the port area and hit the expressway, passing the exits to Pompeii and Herculean, two areas with displays of ruins. Vesuvius was off to our left. Soon we were off the expressway, on a narrow road, climbing a hillside, with a great view back towards Naples. Before we new it, we were over the top and on the Amalfi coast. Our first stop was Amalfi. It has a small, old town center and we wandered that for about an hour. Did a little shopping and then got back into our van, heading westward on the coast road, a road which .. according to our guide/driver ... has over 3,000 curves. Our next stop was Positano, a village incredibly built onto/into a hillside. When we got there it was pouring rain but I was determined to make it down to the beach. Not a day for putting my feet in the water but interesting to look back up the hillside. For lunch, our driver took us to Ristorante da Costantino where we had the sampler lunch: bottle of water, pitcher of wine, caprese salad (the BEST buffalo mozzarella), pizza, pasta, lasagna, cheese crepe and, for desert, fresh fruit salad topped with pistachio ice cream. And that all finished off with a shot of iced cold homemade lemoncello. WOW! The view from this restaurant is alone worth the price of admission. We got lucky and the sky cleared just long enough for us to get some nice pictures. Then onto Sorrento where we hit more rain. A short wander there in the old town area and then back to the ship. The excursion was amazing and the weather, IMO, added 'something' to the scenery and views ... just like we felt in Venice. We loved it and even if we are back in Naples in beautiful weather, I'm not sure I feel we'd have to do it again. We tendered to this port. Turned out to be better than docking. Docking would have left us with a long walk from the pier to town. The tender dropped us off right in the center of town. This island is famous for its windmills. We did some walking and tried to get close to them but couldn't find them. This shot is from the tender on our way back to the ship. A beautiful island and nice to just walk. This destination has been on my bucket list for a long time. It was great to finally make it. I did a lot of research on excursions through the ship, tour guides and doing it on our own. With a lot of help from the Cruise Critic message board, and printouts from sites like Lonely Planet and Wikipedia, we decided to give it a go on our own. And it worked out perfectly. As expected, our ship docked between two tram stations. Taking a guess after leaving the port area, we turned right and it was the correct decision ... the Findikli tram station was just a 5 minute walk. Across the street were two ATMs and I managed to pick the machine that gave me (1) 10 and (2) 20s Turkish lira bills instead of the (1) 50 another cruise passenger got. This was good because the tram token machine accepted a 20 TL bill maximum. We headed off to get on line to enter. I had purposely worn a top with longish sleeves and I had my own scarf with me to cover my head. (For those women without a scarf, they were provided free but not sure I'd want to wear a scarf that had seen lots of heads.) The building was amazing and I'm sure it would have been even more amazing if we did not have heavy clouds that morning. I would have loved to have seen sunlight brightening up the inside but we have to take what we can get. Our next stop was the Topkapi Palace. We were early enough that there were no lines at either the ticket booth or the automatic ticket machines. We entered and went straight to the harem area which required an additional entrance fee. We were practically the only ones in there. Between the posted signs and the literature I had printed off, we had a good idea of what we were seeing. The mosaics throughout the area were beautiful. After the harem, we stopped for lunch at a self-service café at the back of the palace. The weather was clearing and we got an outside table for two overlooking the Bospherus. I got two different main dishes, one basically chicken in filo and the other cheese in filo, cucumber and tomato salad ...all of which we shared, plus a platter of assorted Turkish pastries for dessert. It was perfect. Knowing both time and energy were limited, we made the decision to see just two of the displays in the Palace, the Treasury and the Chamber of Holy Relics (based on suggestions in the literature I had). There were lines at both but both lines moved quickly. In the treasure, we got to see the Topkapi Dagger and in the Chamber of Holy Relics .... well, I think one would have to a believer to appreciate what was there. Inside of the Aya Sophia taken from the upstairs gallery. Our next stop was Aya Sophia. Having been a church and a mosque, it is now a museum. One of the special features is the upper gallery where beautiful frescos are being found from the time it was a church. Climbing up the cobblestoned ramp was an experience in itself. Finally ready to call it quits, we exited the museum and Jerry wanted to know where the tram stop was. We could see the glass covered station from where we stood and both of us were glad it was so close. 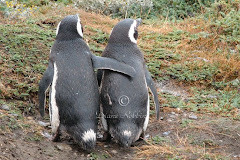 We boarded a crowded car where (with our walking sticks?) two passengers got up and gave us their seats. Back to the Findikli stop, and our five minute walk back to the pier. It was a great day and we were both pleased with how well we had done it on our own. October 13, 2015: From Como, Italy to Venice, Italy, arriving in the pouring rain. Second reason was just lucking out on how our luggage was handled. We had some slight dampness on the outside of our fabric suitcases so either they were stored under cover or brought aboard quickly. Others from our Switzerland group apparently had their suitcases left out in the rain as the entire contents were soaking wet. Princess took care of things by arranging to have everything washed at no charge but our Swiss travel companions were not happy campers and not sure I would blame them. So what did we do? We got on the Venice People Mover and from Piazzale Roma just walked. And walked. And walked. We got to a few dead ends ... part of the fun of being in Venice. We even found ourselves wandering the streets near the hotel we had stayed at during our previous visit. Notice that the reception desk is build above floor level. Finally we headed back to the ship. The Island Princess was moored overnight in Venice, departing the next day at 1 p.m. Once we got back that first afternoon, we just stayed on board, enjoying our port side balcony as the ship sailed away through Giudecca Canal. Coming up ... two days at sea and then Istanbul. Another check off the bucket list. I have made it to the town of Como and the lake, with a lake cruise to see all the beautiful towns and villas on its shores. Unfortunately the day dawned overcast but that didn't stop us. Our only opportunity and we were going to make the most of it, sailing past beautiful villas. Our little boat stopped at the beautiful towns of Bellagio and Mennagio, where we had time to wander. In Bellagio, after strolling around the town, I had time to shop (VBG) and in Mennagio we found a café overlooking the lake for a cup of cappuccino. This stop was the end of our week land tour. That night was a farewell dinner and the next day we would be on our way to Venice to board our ship, the Island Princess. We left Lucerne and continued our trip south. Our route took us over the St. Gotthard pass in the Lepontine Alps which separates Italian speaking Switzerland in the south from German speaking Switzerland in the north. The high point is at about 6,900 feet and the twisting roadway to the pass is 16 miles long. We have been on some harrowing roads in the past, usually in a car. Traveling this route in a huge Mercedes bus made for some excitement. Trust me that this image really does not do the road justice: switchbacks, tunnels, steep drops off the side of the road. It was an experience I'm not too keen on doing again. Finally we reached the top where the cold and wind kept us from wandering around too much, but it was beautiful. And soon we were heading down the other side of the pass. We arrived in Lugano in time for lunch. Most of the group decided to take the optional excursion on the lake which included lunch at Ristorante Roccabella, a restaurant right on the lake, accessible only from the water. We had a fantastic lunch in a gorgeous setting, out on the terrace overlooking the lake. And the best pasta in a pesto sauce I've ever had! That said, the evening we arrived we were on our own. Jerry and I headed out (without cameras!!!!) towards the wooden covered bridge to cross the river, only to find out it was under construction and closed 1/2 way across. No problem. We picked another bridge and wandered around the old city section north of the river. Looking for a place for dinner we stumbled on Mamma Leone Ristorante. Because it was a bit cool out, we ate inside. We started with Nona's combination antipasti, a three tiered selection of meats, cheeses and olives. With glasses of white wine and a shared pizza, we had a great meal for a reasonable price, considering we were in Switzerland, probably the most expensive country in Europe. And by the time we were done, the restaurant was full and we were the only English speaking couple. Nice to know we managed to pick a non-touristy restaurant. A walking tour of Lucerne was scheduled for the next day but the group was presented with an optional tour for the morning. We could go up to Mt. Pilatus using the world's steepest cog railway in the world (at one place 48 degrees), with the trip down via gondola and cable car. Thinking hard about the way down, we decided to give it a try. Day dawned dark and cloudy but a phone call to the hotel at the top told our guide it was clear up there. So off we headed for a great experience, up the side of the mountain with heavy clouds over the landscape. then through the clouds and out into brilliant sunshine. And the reverse on the way down ... both of us a bit nervous about the cable rides but we did it and enjoyed it. Afterwards, we joined up with the rest of the group for a bus ride to see the Lion Monument, carved in memory of the Swiss Guard of Louis XVI. Back in the city, Jerry and I excused ourselves from the remainder of the walking tour (we had wandered the area the previous night) and headed back to the hotel to rest, in preparation for a special evening. That night, our tour included a Swiss folklore show and dinner at Stadtkeller. It was an evening of eating (cheese fondue!) and drinking and a stage show of yodeling, singing and dancing. We headed to Bern, the capitol of Switzerland. Our mouths' dropped open as we came down the hill, approaching the old city. How beautiful! Our visit included a walking tour of the old town. We had perfect weather and enjoyed the walk and sightseeing. 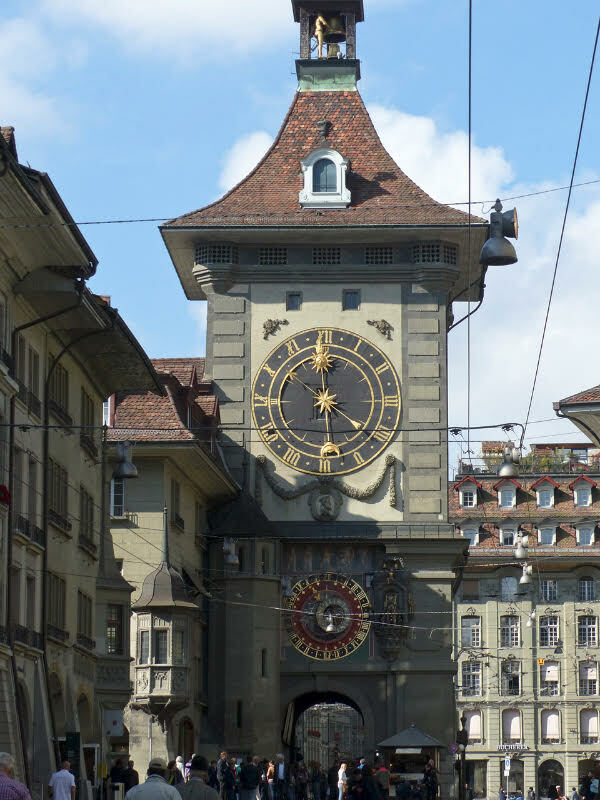 Our final stop in Berne was at the old clock tower, built in 1191, waiting while it struck the hour.